Transportation Oriented Development | James Real Estate Services, Inc.
JRES experience with transportation (or transit) oriented development (TOD) began in the 1990s when Bill James assisted in establishment of Transportation Solutions described below. TOD is typically higher density and mixed uses, generally retail on the ground level, and office or multifamily residential on the upper levels, often with structured parking. Such developments are often located within commuter walking distance to a transit hub or train station. Tenants tend to find enhanced access to such developments at lower cost and owners typically find higher rents and sale prices. Public officials, and owners and tenants of real properties are becoming more and more interested in the efficient use of public and private resources through TOD. As more and more pedestrian friendly environments are developed with “place making” and activation resulting from TOD, JRES increasingly analyzes markets and appraises TOD properties to assist in determination of purchase prices and underwrite financing. In 2008 Bill James was elected to the Board of Directors of the Denver area’s Regional Transportation District, one of the leading local transportation agencies in the country. RTD is building the $7 billion FasTracks rail and bus transportation network to serve the Denver metropolitan area with light rail and commuter rail trains and bus rapid transit. In the face of challenging worldwide economic conditions, RTD applied innovative tools to continue to construct the FasTracks system. The Eagle P3 public private partnership was used to obtain over $1 billion in federal funds to build three FasTracks commuter rail lines at a cost $2.1 billion. Over $300 million in creative federal railroad loans were obtained to help finance the development of the $490 million Union Station transit hub. Two more rail line segments and a bus rapid transit segment of the system are under construction. The FasTracks system will be mostly complete by 2017. As rail stations and bus hubs are developed and opportunities for TOD continue to grow, JRES assists clients by analyzing markets and appraising properties responding to the demand stimulated by the system. JRES also assists local governments, property owners and developers to analyze the changing real estate markets in response to FasTracks and determine how to most cost effectively develop infrastructure to serve that development. 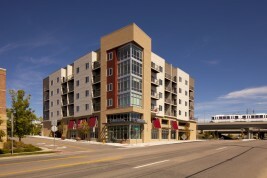 An important segment of TOD is the affordable housing work described above, with a wide variety of other building types. JRES often assists with land development and infrastructure decisions by providing commercial, residential and mixed use land appraisals and market studies, which include forecasts of the sale prices and market absorption rates of individual subdivided lots, residences and commercial/industrial properties. The market based forecasting required often includes assessment of entitlements possibilities and the highest and best use of land. In addition to revenue forecasts, financial analysis generally includes the costs of development of infrastructure, and forecasting and discounting of cash flows to present values. As transportation becomes more and more an important part of the formula for successful real estate development, JRES expands and enhances its real estate appraisal and consulting practice by developing and participating in community and transportation oriented resources. In 1997 Bill James assisted with the founding of Transportation Solutions which serves the southeast quadrant of the City of Denver. Bill continues to serve on the Transportation Solutions Board of Directors. Transportation Solutions is a transportation management association (TMA) the mission of which is to promote the use of transportation modes other than single occupancy automobiles to enhance air quality and mitigate traffic congestion. Transportation demand management (TDM) is the encouragement of the use of modes of transportation (such as busses or trains) alternative to single occupancy vehicles in an attempt to improve traffic congestion and air quality. As public officials and private developers realized that TDM could be accomplished better by local public-private partnerships, TMAs grew across the country in the 1990s. Additional transportation modes encouraged by TMAs include bicycles, car and van pooling, walking and shared resources such as car and bicycle sharing. Occasionally, the effort to gain land use entitlements, or development plan approval for a property can be advanced more effectively if the services of a TMA are used to mitigate trips generated to and from the property. As a part of its real estate consulting practice, JRES considers the advantages that can accrue to a property resulting from the services of a TMA in the area and occasionally consults regarding the development of TMAs. To speak with a transportation oriented development expert, please call 303-388-1100 or fill out our contact form.